Author Benjamin Hoff shows that the philosophy of Winnie-the-Pooh is amazingly consistent with the principles of Taoism and demonstrates how you can use these principles in your daily life. Is there such thing as a Western Taoist? Benjamin Hoff says there is, and this Taoist's favorite food is honey. Through brilliant and witty dialogue with the beloved Pooh-bear and his companions, the author of this smash bestseller explains with ease and aplomb that rather than being a distant and mysterious concept, Taoism is as near and practical to us as our morning breakfast bowl. Romp through the enchanting world of Winnie-the-Pooh while soaking up invaluable lessons on simplicity and natural living. While Eeyore frets and Piglet hesitates and Rabbit calculates and Owl pontificates, Pooh just is. And that's the clue to the secret wisdom of the Taoists. The Tao of Pooh is an international bestseller and the first Taoist-authored book in history to appear on bestseller lists, it remained on The New York Times’ bestseller list for 49 weeks. This book is simple but deep at the same time. There is a Chinese saying "One disease, long life. No disease, short life." Those who know what's wrong with them and take care of themselves will live a longer life than those who think they are perfectly healthy and neglect the things around them. A weakness can do you a favor if you acknowledge it's there and work with it. Therefore, a weakness can be a strength. There are many little nuggets like this in the book. The familiar stories of Winnie-the-Pooh are delightful analogies for illustrating some of the principles of Taoism. It's an easy introduction to Taoism through storytelling. I first heard of this book from my brother and was instantly intrigued years ago. When I saw it on audible I decided to try it. I am very open to learning about different philosophies and religions and the tao of pooh was a very clever and interesting twist to doing so. 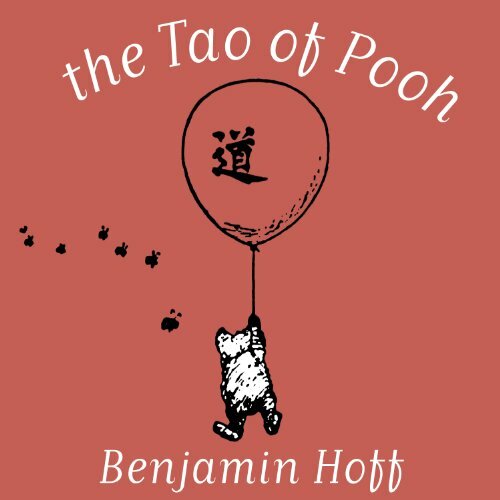 Since I didn't know anything about taosim prior to reading this I couldn't say if Hoff's explanations of taoist concepts were spot on, but from what it seems like, the Pooh stories were the perfect analogy for it. This is a wonderful little book. I have a hard copy but with Simon Vance doing the narrating and being on sale, I could not resist the audio version. This may not be a book for everyone. Taoism is probably a rather arcane subject for the uninitiated. For those who have delved its depths or even those who have not but have an interest in the subject, this is a great little primer. The book is simple and deep at the same time (yin and yang). It is both serious and humorous. The narration is impeccable. If you are interested in further reading on the subject, for the original Tao Te Ching, I would highly recommend the translation by Stephen Mitchell who is also the narrator and available on Audible. 81 sur 87 personne(s) ont trouvé cet avis utile. Would you listen to The Tao of Pooh again? Why? Yes. It makes your realise that life is a lot less complicated then we are lead to think. His understanding of the message the writer was putting across. When I read this many years ago it changed something inside me. I have recommended it to many over the years. Re-visiting this book, while not with the original spark, was a wonderful and necessary part of my journey. Anyone who is drawn to self exploration and growth needs to read this. 35 sur 39 personne(s) ont trouvé cet avis utile. What did you love best about The Tao of Pooh? It's so simple and easy to follow. It's easy to relate to my own life and life experiences. The owl not being able to solve a problem that Piglet was able to solve. Great narrator - made the experience truly engaging. Where does The Tao of Pooh rank among all the audiobooks you?? ?ve listened to so far? My 2-1/2 year old requested the Tao of Pooh when we got in the car the other day. The vinegar tasters is my favorite part of this book. When is the Te of Piglet coming to audio? This is a standard book I keep on my phone. I plan to listen to it once a year. In this short book, Pooh, The Uncarved Block, illustrates the wisdom of Taoist teachings. While other characters in the Hundred Acre Wood cling to faulty knowledge or pursue goals of little value, the simple, humble Pooh goes with the flow and finds contentment. Rather than pompously search his mind for answers, like Owl, or try to seize control of the situation, like Rabbit, or fail to account for his limitations, like Tigger, Pooh just exists in the moment he’s in and lets the answers come to him. Thus, he exemplifies the concept of pu, living life open to experience, while not being burdened by unnecessary abstractions or desires. Benjamin Hoff writes in whimsical way, imagining himself having conversations with Pooh, Piglet, and others as he works on his manuscript, Pooh characteristically preferring to talk about things that are of direct interest to Pooh, such as honey. Hoff seems to assume that the reader remembers more of the plot points and humor of A.A. Milne’s classic children’s stories than I actually did, but I was able to get by well enough. All in all, it’s a short but instructive introduction to Taoist thinking. Hoff quotes philosopher Laozi, who might sum it up best himself: “to attain knowledge, add something every day. To attain wisdom, subtract something every day.” Does all the clutter we fill our minds with help us? Or get in the way of experiencing what’s real? Always a worthwhile question. Audiobook narrator Simon Vance does a decent job, but I wish he’d given a little more character to the voices. It points the way to understanding Tao wisdom in simple understandable language. The audio book replaced the tattered paper back copy that I read years ago and have kept in my library. It is a delighful little story that opened my eyes to how much we are manipulated and misdirected by pretense and nonsense. Take the journey and become more enlightened. Read and re-read this little gem and other Taoist works until what is written is clearly understood. Pooh will thank you for it. Perhaps if the author hadn't taken a no-holds-barred offensive stance against everything apart from Taoism, or if he hadn't torn the characters apart to get them to fit around the characters he needed them to be to get his point across, I might have thought his words were more worthwhile. But as far as this book is concerned, everything except Taoism is the root of all evil in the world and must be stopped with the principles and application of Taoism, and the beloved characters from Winnie the Pooh were left as casualties in the aftermath. Learning about Taoism was interesting, and the use of Winnie the Pooh in orchestrating that was creative (hence the two stars instead of one), but the entire book was riddled with accusations about every other mode of thought being unambiguously inferior to Taoism without even the consideration to say that there are benefits to them. Near the end of the book, the author even has the gall to say that being clever or scholarly (as opposed to following the way of Tao) will bring about the end of the world and that whatever is left to the few people who survive won't be worth looking at; that is a bit of a paraphrase, but only a bit. The book is aggressively against any sort of knowledge-gathering, any sort of self-advancing effort, and basically anything anti-Tao. This moral is expressed by manipulating the characters of Winnie the Pooh by stretching their characterizations out of shape. Poor Eeyore was changed into an aggressive, useless, self-aggrandizing monster for no reason than because he's usually a bit blue. And for being the characterizations of cleverness and scholarly knowledge-seeking, Rabbit and Owl are portrayed as hasty and useless respectively. And Pooh Bear is the Messiah and can do no wrong, even when he's being just as useless as anyone else. The original premise, that Pooh Bear epitomizes Taoist philosophy, may be correct and may be worthwhile, but the slaughter of the rest of the characters just so that they can suit the needs of an extended metaphor is a blatant misuse of them. The last straw for me was when the author extolled the virtues of a man living over two centuries by following the path of Tao. A philosophy causing substantial enough life changes to prolong the life of someone to nearly twice was the oldest living person at present has lived? And his life is so much better than he can outrun young men? The author has no incredulity and, after that bit, I can't find it in myself to take anything he says seriously. All in all, it was an interesting premise, but the application just didn't work for me. 40 sur 49 personne(s) ont trouvé cet avis utile. What made the experience of listening to The Tao of Pooh the most enjoyable? The book goes by quickly. I was done with it in about a week. Very insightful, but entertaining to listen to at the same time. The messages are conveyed well with little stories along the way using the characters from the Pooh books. I would absolutely reccomend it.